We will be releasing the A2A Simulations Piper J-3 Cub on FSX: Steam Edition in the coming weeks. What originally prompted you to virtually replicate this particular aircraft? After a few years of developing our Accu-Sim technology, which adds both immersion and realism to an airplane, some people still were under the impression Accu-Sim was simply damage modeling. When in fact, simulating proper wear and tear was just a very small part of the entire experience. But unfortunately, some who never experienced Accu-Sim tended to align us with the myriad of other “realistic” flight simulations that really missed the mark big time by making airplanes either way to fragile or too hard to fly. So we decided to do the most famous stick and rudder airplane ever made, the J-3 Cub, so we could both show the world what Accu-Sim was about and really concentrate on the fundamentals of flight. It was funny because, up to the point when the J3 was released, we had many people saying “why do a J-3? What is to Accu-Sim?” I kept smiling when reading those posts, knowing what was coming. Needless to say, after the plane was released, we never heard that question again 🙂 The J-3 went on to receive rave reviews everywhere. I understand you are a pilot, yourself. How much does that influence your work? It has become a bigger influence over time, as there are just so many times when in the cockpit, I notice something and think “we really have to simulate this.” So yes, development really orbits around both our real world experiences and imagination, and putting it all together into a product. For those simmers who may not be familiar with your previous work, what is Accu-Sim and how does it enhance the flight simulation experience? First, Accu-Sim pushes the physics of flight to a new level. It’s fluid, yet responsive, just like a real aircraft. It then ties the entire sound system into these physics, making a plane “come to life.” The end result is a feeling of oneness with the airplane. Will we see more A2A Simulations titles available for FSX: Steam Edition in the future? I believe so – we expect Accu-Feel to come out down the road, that will bring a “touch of Accu-Sim” to every airplane installed in FSX. It’s our most popular product in our library. 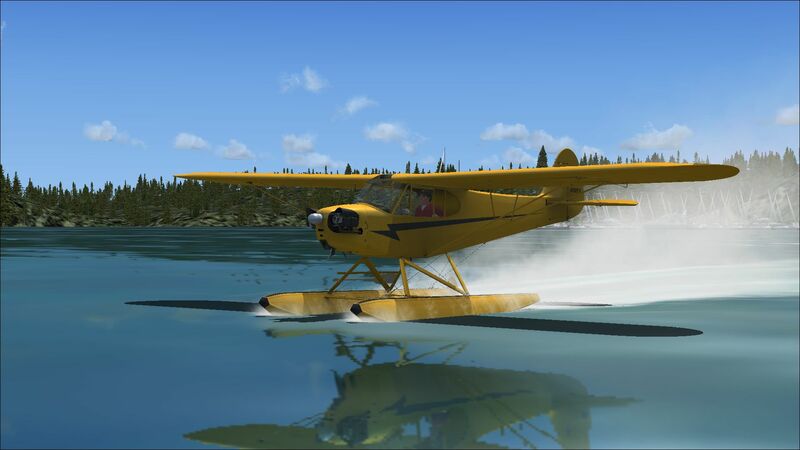 TakeFlight Interactive developed Air Alaska, a mission pack specifically based around your J-3 Cub. Do you have plans to work in tandem with other developers to create more A2A-specific mission packs? I’ve known the people at TakeFlight for some time, and we stay in pretty close contact, sharing what projects we’re working on. So certainly, when we’re both in a similar place to work on something, we certainly will. Is there any other exciting news from A2A you would like to share with us? Well, 2014 was our best year and 2015 is turning out to be even better, making 2015 our 7th consecutive year of growth at A2A. With ever bit of grown, we invest more and continue to build and create better experiences. I’m pretty proud of our now rather large library of works of passion from our team. Now with Dovetail on the scene, an already bright future to flight sim is even better. I know this all sounds like a cliché, but it’s the plain truth. We’ve sat back over the past 10 years listening to the short-sighted, fatalists predicting the demise of flight simulation. These same people were also talking about the end of PC gaming. Well, here we are ten years later and both flight simulation and PC gaming are still rock solid and still going strong with no end in sight. I’m glad we stayed invested in flight simulation, as we knew then and know now, it’s a solid investment. We would like to thank Scott once again for taking the time to speak with us. A2A Simulations J-3 Cub will be available for FSX: Steam Edition in coming weeks. In the meantime, head over to http://store.steampowered.com/app/314160 for the latest exciting add-ons for FSX: Steam Edition.